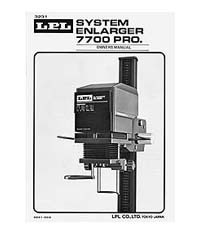 High quality reproduction of the original instruction manual for LPL 7700 series Condenser enlargers. (In the USA the same enlarger is sold as the Omega/LPL 670CXL Triple Condenser enlarger, and previously as the Saunders/LPL 670CXL Triple-Condenser enlarger.) 5"x 8" format. Staple bound. 15 pages.